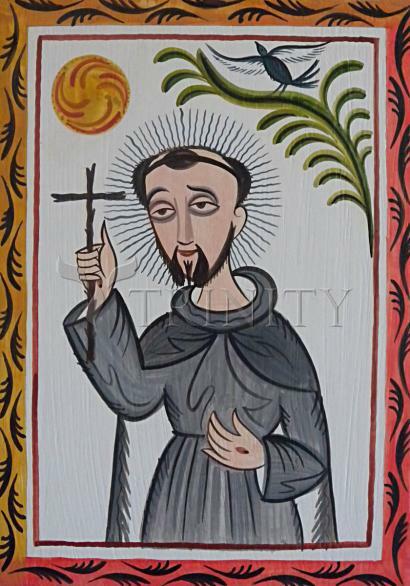 Founder of the Franciscan Order, born at Assisi in Umbria, in 1181 or 1182. His father, Pietro Bernardone, was a wealthy Assisian cloth merchant. Of his mother, Pica, little is known, but she is said to have belonged to a noble family of Provence. Francis was one of several children. The legend that he was born in a stable, dates from the fifteenth century only, and appears to have originated in the desire of certain writers to make his life resemble that of Christ. At baptism, the saint received the name of Giovanni, which his father afterwards altered to Francesco, through fondness it would seem for France, whither business had led him at the time of his son's birth. In any case, since the child was renamed in infancy, the change can hardly have had anything to do with his aptitude for learning French, as some have thought. Francis received some elementary instruction from the priests of St. George's at Assisi, though he learned more perhaps in the school of the Troubadours, who were just then making for refinement in Italy. However, this may be, he was not very studious, and his literary education remained incomplete. Although associated with his father in trade, he showed little liking for a merchant's career, and his parents seemed to have indulged his every whim. Thomas of Celano, his first biographer, speaks in very severe terms of Francis's youth. Certain it is that the saint's early life gave no presage of the golden years that were to come. No one loved pleasure more than Francis; he had a ready wit, sang merrily, delighted in fine clothes and showy display. Handsome, gay, gallant, and courteous, he soon became the prime favorite among the young nobles of Assisi, the foremost in every feat of arms, the leader of the civil revels, the very king of frolic. But even at this time Francis showed an instinctive sympathy with the poor, and though he spent money lavishly, it still flowed in such channels as to attest a princely magnanimity of spirit. When about twenty, Francis went out with the townsmen to fight the Perugians in one of the petty skirmishes so frequent at that time between the rival cities. The Assisians were defeated on this occasion, and Francis, being among those taken prisoners, was held captive for more than a year in Perugia. A low fever which he there contracted appears to have turned his thoughts to the things of eternity; at least the emptiness of the life he had been leading came to him during that long illness. With returning health, however, Francis's eagerness after glory reawakened and his fancy wandered in search of victories; at length, he resolved to embrace a military career, and circumstances seemed to favour his aspirations. A knight of Assisi was about to join "the gentle count", Walter of Brienne, who was then in arms in the Neapolitan States against the emperor, and Francis arranged to accompany him. His biographers tell us that the night before Francis set forth he had a strange dream, in which he saw a vast hall hung with armor all marked with the Cross. "These", said a voice, "are for you and your soldiers." "I know I shall be a great prince", exclaimed Francis exultingly, as he started for Apulia. But a second illness arrested his course at Spoleto. There, we are told, Francis had another dream in which the same voice bade him turn back to Assisi. He did so at once. This was in 1205.